You’d think by now everyone would know you don’t diss a Jersey girl. That's right: "Eat Pray Love" author Elizabeth Gilbert is a Jersey girl. But apparently dear Julia Roberts didn’t get the memo. According to a report on the New York premiere last night of “Eat Pray Love,” the author of the book upon which the film is based – aka beloved Frenchtown, NJ, resident Elizabeth Gilbert – was shut out of a *private* celebratory party hosted by the film’s star, Julia herself. Julia Roberts walks the red carpet at the New York premiere of "Eat Pray Love" on Aug. 10. As Roger Friedman reports, Julia shanghaied most of the stars in attendance for her own private gathering, which was held upstairs from the main party. Among the people she determined were worthy of her company were the entire cast, as well as guests Josh Brolin, Eddie Vedder (yes, that Eddie Vedder) and Julian Schnabel. But Elizabeth, for some totally unfathomable reason, was excluded. Julia Roberts didn't appear to have a problem sharing the limelight with "EPL" author Elizabeth Gilbert on "Oprah" earlier this year./Photo credit "Oprah"
You’re totally blowing my bubble about you. You’ve done such a wonderful job of appearing real and down-to-earth, not stuck up at all. You’ve even gone on “Oprah” and acted like you totally dig Liz. Do I really need to remind you that if it wasn’t for Liz Gilbert there would be no movie for you to star in? “Eat Pray Love” isn’t just written by Liz… it’s about her L-I-F-E. If she hadn’t experienced all of those things first-hand, there would be no book, much less a movie for you to star in. Jersey girls clean up real nice, don't they? 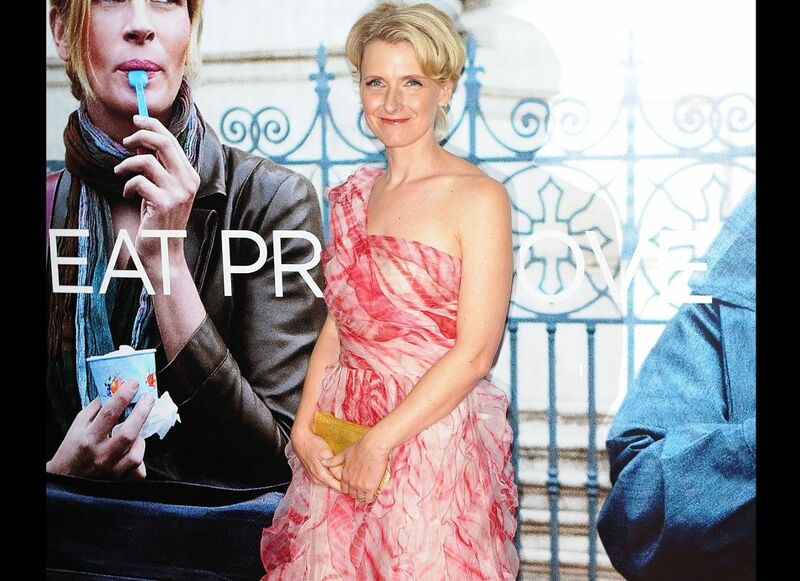 Elizabeth Gilbert walks the red carpet at the New York premiere for "Eat Pray Love." Of course, this could all be a huge misunderstanding. Security guards at the event perhaps were a bit too protective of the movie star. But really, if Julia realized Liz wasn’t present (and really, if you’ve spent months *portraying* someone, living in their head, etc., wouldn’t you notice if they weren’t around? Not to mention that they both walked the red carpet beforehand), don’t you think she would make sure Liz was invited to join her little party? Beats me. But as a lifelong Jersey girl, I’ve gotta defend my own. Don't worry, Liz. I got your back. 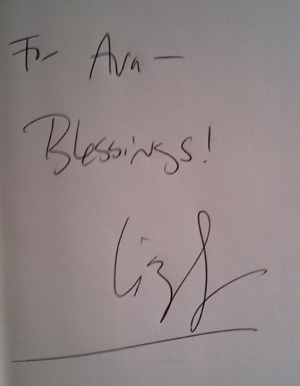 I met Liz at a book-signing in her hometown, Frenchtown, a couple years back. She was extremely down-to-earth and sweet, and she took the time to sit for a few moments with each and every person (well, OK, every woman) who came to meet her. I remember telling her that I was also a writer (at the time I was a TV/features reporter at a local newspaper), and that I’d found “Eat Pray Love” to be so very inspiring. I also told her I could only hope to write something so meaningful to so many people someday, and she accepted my praise very graciously. So, if you liked “Eat Pray Love,” I recommend you check out Liz’s latest book, “Committed.” I know a lot of reviewers trashed it when it was released earlier this year, but I found it extremely interesting and thought-provoking. It isn’t exactly in a vein similar to “EPL,” but it’s very readable nonetheless and I enjoyed it. And give Jersey gal Liz some love: Visit her website, tell her how much you love her book and/or the movie. I know she’ll appreciate it. In the meantime, I’ll meditate on forgiving Julia and/or the bodyguards for last night’s debacle. Serenity now! Liz Gilbert gets in touch with her higher self. I understand your points, Christine. Elizabeth Gilbert has always stated she used the advance the publisher gave her to travel to those countries. I think she has more problems with the institution of marriage itself than anything her ex-husband did or didn’t do. (She explores those feelings in great detail in “Committed,” her new book.) We can’t all expect to know exactly what was going on in her head at the time – and I can’t imagine how the movie would ever be able to convey that, anyway – but I think all women can understand that historically marriage is different for women than it is for men. And I would argue that India is by no means expensive. I don’t recall when she came up with the idea to visit only countries beginning with “I,” but maybe that’s why she singled out these three. At any rate, her journey was more about finding herself – and coming to terms with what she wanted out of life – than anything else. And I think a lot of people can relate to that… and wish they had the time/money/wherewithall to do it. Wow! I’m shocked by this as well. I thought Julie would be one of the nice people of Hollywood. I’m with you…What the heck??? How can you diss the person responsible for the book, the role, and the movie??? SMH…SMH…Shame on you, Julia! Eat, Pray, Love would be authentic if she wasn’t loaded when she embarked on her journey. Who wouldn’t travel for a whole year if they had the money to do it. She lived as a tourist in those countries – stayed in a luxery apartment while she complained about her depression and ate the most expensive, best Italian foods in he most expensive city of Rome, Italy, and did the same in Bali and India – didn’t have to worry about a thing. What is there to complain and be depressed about? Seems the basic premise of the book was the fact that she felt stifled in a marriage and didn’t want to have children and was tired of living an empty fake life. Whoop dee doo. Elizabeth’s husband didn’t cheat or abuse her in any way – perhaps this caused her to become completely self absorbed and spend a lot of money to embark on spending some time alone in exotic expensive wonderlands. Did she go to central america or vietnam? No, she went to the most expensive, extravagant exotic places in the world and stayed in the finest of luxury. But she tells a good story and people seems to buy it. Now it makes Julia Roberts all the more richer, rich in her inflated ego and bank account. And the real heros of the world are celebrated……how..? Update: Elizabeth Gilbert went to the most expensive exotic places because it was already paid for by Viking publishing. How authentic can Gilbert’s journey be -particularly when she’s been funded by a publishing house before the actual journey. You do know that Elizabeth Gilbert’s “trip” was paid for by Viking, right? I guess this isn’t unusual, to pitch a story idea and then go live out the story… but then again, where’s the line between authentic and contrived, especially if you’re expected to write a book by the end of it?